In part 46 of my youtube countdown, we travel back to the past again, my past. When I was 17 years old, “Strawberry Fields Forever” was my favorite song in the world. I don’t know why exactly, but this song just seemed like the greatest work of music I’d ever heard. I loved the loping mellotron introduction. I loved the way John’s voice stretched over the distorted string quartet, as if it were being pulled like taffy. I loved Ringo’s manic jungle like drumming. In fact, this is the most psychedelic drumming Ringo achieved with the Beatles, a massive achievement in a string of drumming highlights for Ringo in this period, (A Day in the Life being Ringo’s true drumming masterpiece.) I remember as a teenager writing the words, “Living is easy with eyes closed,” everywhere; in my notebooks, on desks, on my locker, on walls. I remember finding an old newspaper in my attic that my dad had from 1969 with the original “Paul is Dead” article, highlighting all the clues, with one claiming that John is chanting “I buried Paul” in the outro. The reality of course being him saying “Cranberry Sauce;” (an equally delicious phrase in a song full of gorgeous imagery.) Speaking of gorgeous imagery, the video I present here is the most perfect, stunning capture of the Beatles legendary video for “Strawberry Fields.” The video presents the Beatles at their most weird. They are reveling in their artistry and merry prankster like shenanigans. What is the theme of this video? As far as I can tell, the Beatles are gathering in a field, and are constructing some sort of magical piano by tying the strings to a tree. Then of course they paint it with beautiful psychedelic colors. 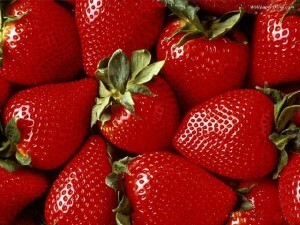 So, here you go, unabashed strawberry love from me to you. This entry was posted on Tuesday, April 26th, 2011 at 1:24 pm and is filed under The Beatles, Youtube Favs. You can follow any responses to this entry through the RSS 2.0 feed. You can leave a response, or trackback from your own site.